The Association of Book Publishers of British Columbia was formed in 1974 under the original name of the British Columbia Publishers Group. In 1978 the present name was adopted. Their membership stood at 45 in 1989. The ABPBC aims to assist and promote book publishing in B.C. through liaison activities with the public, government, and business. It is an affiliate of the Association of Canadian Publishers. The three types of memberships, Active, Associate, and Supporting, are based upon the number of books published. The fonds consists of records relating to the ABPBC’s activities. 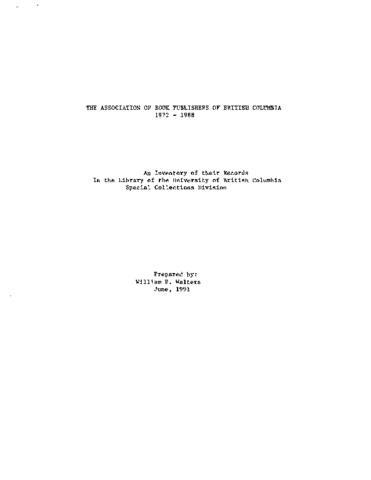 Records cover the period of time from the ABPBC’s inception to 2015 and pertain primarily to the book publishing industry in the province of British Columbia. The ABPBC’s activities included applying for funding from a range of provincial and federal organizations and governments, holding meetings, advocating for their members to the provincial government, promoting their members, undertaking special projects, and researching areas pertinent to the provincial book publishing industry. Specific administrative activities the organization undertook included maintaining its multi-level membership base, managing finances and funding applications, electing executive teams, and overseeing various projects. The fonds spans five accruals, organized into four distinct sets of series. These sets of series are represented in the PDF finding aid attached. Finding aid updated by Gillian Dunks in December 2016.